A guide to The Royal Ballet's quintessential fairytale ballet. When The Sleeping Beauty was first performed in St Petersburg in 1890 it wasn’t immediately popular. Russian audiences, who were used to formulaic, uncomplicated ballet music, found Tchaikovsky’s richly symphonic score impenetrable, and they thought that director Ivan Vsevolozhsky’s designs were too lavish. However, these very qualities, along with the ballet’s fairytale libretto, appealed to a generation of luminaries including Stravinsky, Balanchine and Pavlova, who championed the work. Beauty was the most performed ballet in the early Soviet repertory and has since been adapted by numerous choreographers, becoming a classical ballet favourite. When Vsevolozhsky proposed the subject of The Sleeping Beauty to Tchaikovsky, the composer was delighted. He had always loved ballet, and leapt at the chance to compose the music for another fairytale after his 1877 Swan Lake. His passionate score skillfully expresses the drama and this, along with moments such as the tender and beautiful Act III love pas de deux, make Beauty one of the greatest ballet scores of all time. During World War II the Royal Opera House stopped producing opera and ballet and became a dance hall (an era celebrated in the present day with the ROH's monthly tea dances). There was a possibility that it would remain so after the war, but it was eventually agreed that it should resume its former identity. Ninette de Valois’ Sadler’s Wells Ballet was chosen to perform at the reopening on 20 February 1946. De Valois selected The Sleeping Beauty – already a company favourite – as the work that would be performed, in a new production. The ballet, with stunning designs by Oliver Messel, dazzled audiences and restored the Royal Opera House to its former glory. It also cemented the position of Sadler’s Wells Ballet (which was to become The Royal Ballet) in its new home. 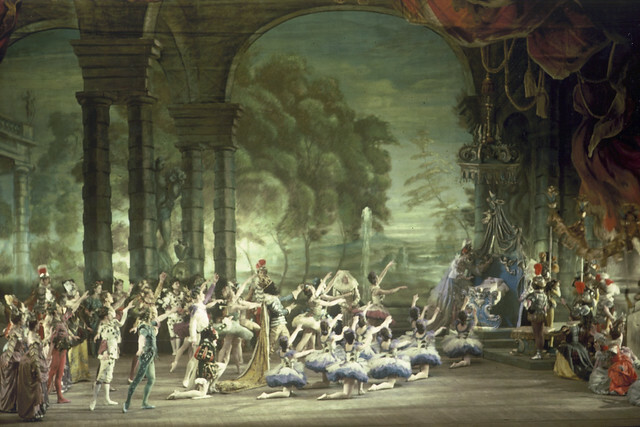 The Rose Adagio from Act I of The Sleeping Beauty is one of ballet’s most famous set pieces. It occurs during Princess Aurora’s 16th birthday party. After a lively, fleet allegro entrance, she is introduced to four suitors with whom she dances an adagio containing eight very exposed and challenging unsupported balances. The sequence has become one of the most loved and most parodied in all of ballet; Christopher Wheeldon included a slapstick version of the dance, the so-called Tart Adagio, in his 2011 ballet Alice’s Adventures in Wonderland. The Sleeping Beauty, like many famous ballets, is a constantly evolving work. Over the years, figures from Sergei Diaghilev to Helgi Tómasson have created their own interpretations of Marius Petipa’s original choreography, along with unique designs from a variety of artists. Monica Mason and Christopher Newton’s 2006 The Sleeping Beauty for The Royal Ballet (the production that the Company performs today) returned to Petipa’s original steps, but interpolated choreography from Frederick Ashton, Anthony Dowell and Wheeldon. The designs for the current revival incorporate fairytale sets and costumes by Peter Farmer with others that have been gradually altered to resemble Messel’s vibrant originals. Each time the production is performed there is something new to admire. The Sleeping Beauty runs from 21 December 2016 — 14 March 2017 . Tickets are still available. Production sponsored by Coutts and generously supported by Sarah and Lloyd Dorfman, Peter Lloyd and in memory of Ellen Burkhardt, with additional philanthropic support from The Royal Opera House Endowment Fund. Original production (2006) made possible by The Linbury Trust, Sir Simon and Lady Robertson and Marina Hobson OBE. So looking forward to seeing the wonderful Natalia Osipova and Matthew Golding in Sleeping Beauty on April 9th !